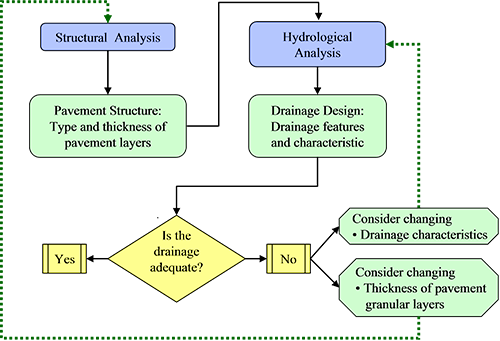 Hydrologic designs are is generated from a non-proprietary program by the U.S. Federal Highway Administration called Drainage Requirements in Pavements or DRIP. 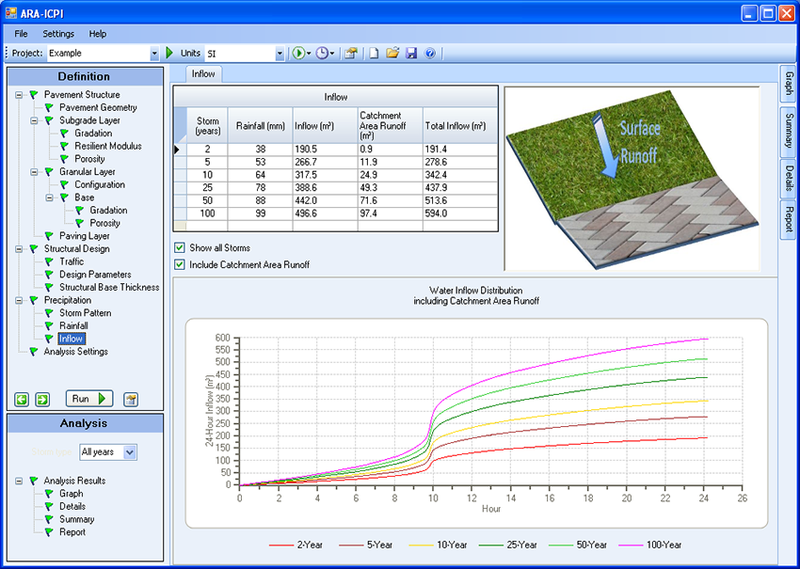 The program uses a water balance approach that allocates all rainfall directly onto or contributed as run-on from adjacent surfaces. 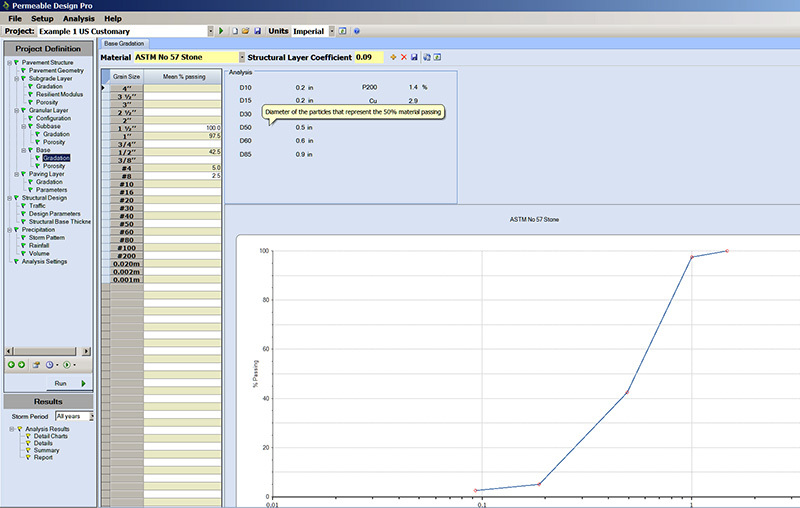 The program allocates these volumes to infiltration and outflow based on default values and/or user prescribed input values. 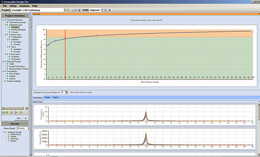 The model uses time steps to generate inflow and outflow hydrographs. 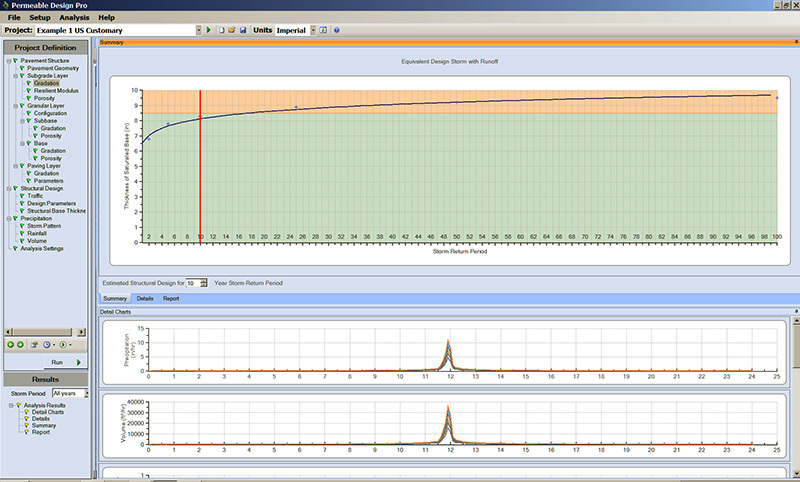 Time step intervals for modeling rainfall and flows can be user-designated in 01, 0.2, 0.3, 0.4, 0.5 and 1 hour increments. 24-hour rainfall events can be modeled for 2, 5, 10, 25, 50 and 100 year return periods using synthetic NRCS Type 1, 1A, 2, and 3 storm patterns for many U.S. and Canadian cities, or with user designated events. 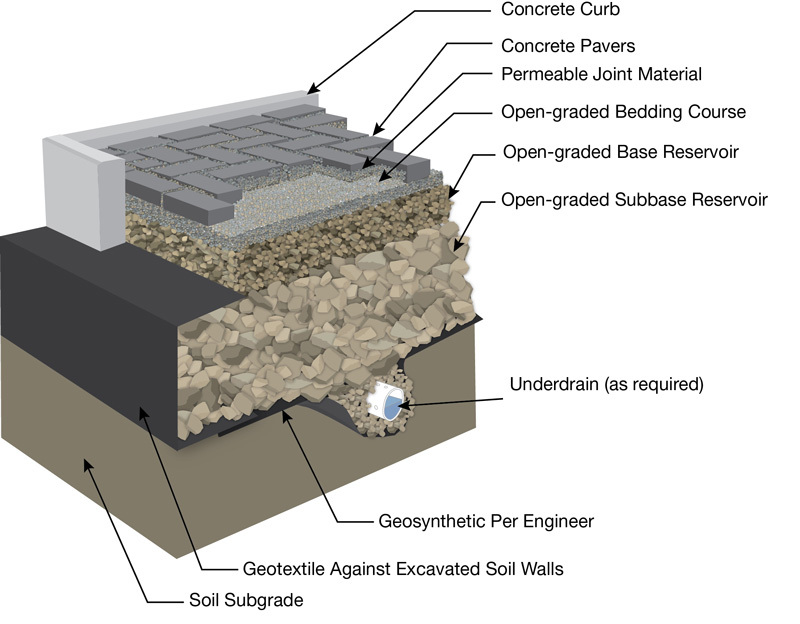 Underdrains are modeled as pipes at the perimeter of rectangular or square PICP areas, or along an alley or street. Outflow pipe and slope can be varied to balance outflow with infiltration for selected rain events especially in low-infiltration soils. The program generates a chart illustrating the required base/subbase thickness to store and infiltrate water for desired storms. 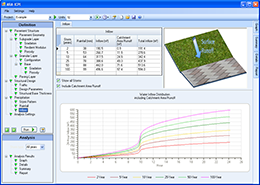 Structural design relies on the flexible pavement design methodology in the 1993 Guide for Design of Pavement Structures published by the American Association of State Highway and Transportation Officials (AASHTO). The user characterizes the soil subgrade strength and expected traffic determined by lifetime 18,000 lb (80 kN) equivalent single axle loads. 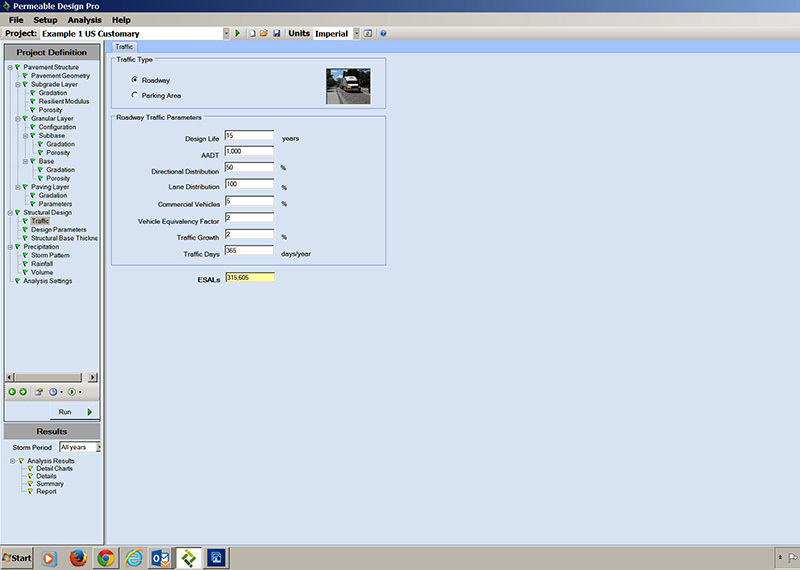 The program calculates the required Structural Number and provides conservative layer coefficients for the concrete pavers and bedding stone, base and subbase aggregates. The program calculates the required subbase thickness to satisfy the Structural Number. After running the program, the designer is provided with a base/subbase thicknesses for water storage and for supporting traffic. The designer selects the thicker subbase for the design solution. 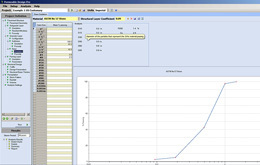 A major strength of the program is enabling the designer to conduct sensitivity analysis on hydrologic and structural inputs especially when field data for some inputs is incomplete or absent. 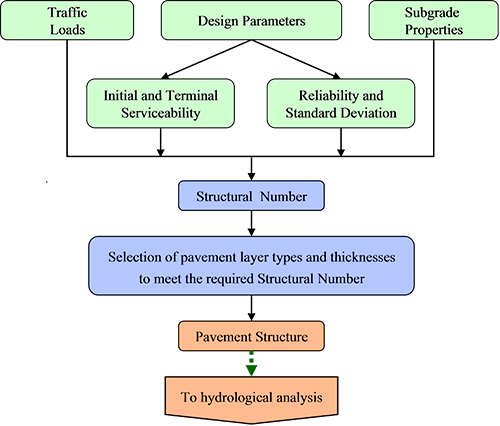 The design of porous pavements can be somewhat complicated due to the interaction of the hydrologic properties and the structural properties of the pavement structure. The key component of the structural design of a pavement is to ensure that the pavement surface reduces the stresses and strain at subsequent layers to prevent any significant plastic deformations. 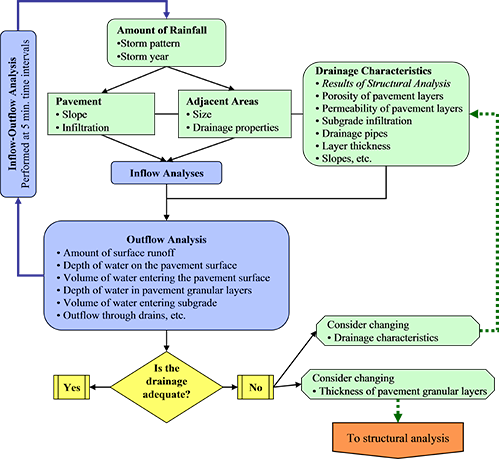 A hydrological analysis has been incorporated into the design procedure to assess if the rainfall can be stored and released by the pavement structure provided.